Decoupage, the art of gluing paper decorations on other objects, comes from the French word "couper," to cut. Decoupage adorns candle holders, furniture, vases and other types of decorative objects. You can use decoupage on any surface that can be glued. 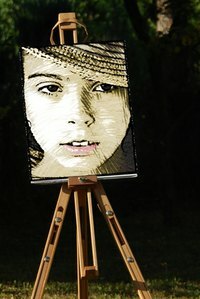 Create color copies of favorite pictures on a home computer printer or commercial color photocopier and make your own works of art decoupaged on canvas. Frame the finished art canvases or display them on easels. This inexpensive craft project makes an engaging activity for all ages. Kids can decoupage family pictures, school projects or their own photographs with this basic technique. Place the color copy picture on a cutting board. Cut the color copy picture the way you want it to appear on the canvas. For example, crop a family group photo two inches from the top and sides to reduce the amount of background and give more focus to the people. Cut the picture so it's square or rectangular, or give it wavy edges by cutting curves around the image. Set the canvas on the table. Place the color copy photo on the canvas. Use a ruler to center the picture the way you want it to look. For example, center the faces on the canvas. Measure from each side. Adjust the picture's position so that the same amount of canvas shows on each side. Mark the desired location for the picture with a pencil—making light "L" shapes at the corners will show the correct placement. Paint the canvas border—outside of the pencil marks—with acrylic paint. Paint the edges of the stretched canvas, if you aren't going to frame it, to give the artwork a more finished look. Allow the paint to dry. Pour the glue in a bowl. Turn the color copy picture face down and spread a thin layer of glue over the back of it with a sponge brush. Center the picture over the canvas. Line the corners up with the pencil marks and press it down. Smooth the picture carefully with your hands. Apply the glue in a thin layer over the color photocopy with a fresh sponge brush. Work in slow, even downward strokes, using a steady pressure to avoid bubbles. Allow the picture to dry thoroughly. Repeat, applying four to six coats of glue over the color photocopy on the canvas. Allow the color photocopy picture to dry between each coat. Regular paper, not coated or photographic, works best for decoupage. Use a commercial decoupage medium, available from a craft supplier, if preferred.